Three in four across 10 countries fearful Cyber Attacks could damage their country’s economy. Three quarters of surveyed adults (75 percent) across 10 countries say they are fearful that cyber hackers are carrying out attacks on major industries and sectors of the economy in their countries, according to the results of a study announced recently by Honeywell Process Solutions. Many survey respondents (36 percent) indicate they do not believe that it is possible to stop all the cyber attacks. A similar proportion (36 percent globally) report they don’t have faith in their country’s ability to keep up with cyber attacks because they feel that governments and organizations are not taking these threats seriously enough, particularly those respondents in India (61 percent), China (48 percent), and Mexico (47 percent). The British government estimates that cyber security breaches at British energy companies alone cost those companies about 400 million pounds ($664 million) every year. In the United States, the Department of Homeland Security said that more than 40 percent of industrial cyber attacks targeted the energy industry in 2012, the last full year reported. These are findings of a poll conducted by Ipsos Public Affairs Research, September 2- 16, 2014. For the survey, a sample of 5,065 adults across 10 countries was interviewed online. This included approximately 500 interviews in each of Australia, Mexico, Russia, Brazil, China, India, Japan, the United Arab Emirates, Great Britain and the United States. Results are weighted to the general adult population ages 16–64 in each country (or in the U.S. 18–64). A survey with an unweighted probability sample of 5,065 adults and a 100% response rate would have an estimated margin of error of +/- 1.4 percentage point, 19 times out of 20 of what the results would have been had the entire population of adults in the participating countries been polled. Each individual country would have an estimated margin of error of 4.4 percentage points. All sample surveys and polls may be subject to other sources of error, including, but not limited to coverage error, and measurement error. For more than a decade, HPS has developed and delivered cyber security technology and solutions to industrial customers around the world through its Honeywell Industrial Cyber Security organization. This team has delivered more than 500 industrial cyber security projects integrated with its process automation solutions which are used at sites such as refineries, chemical plants, gas processing units, power plants, mines and mills. 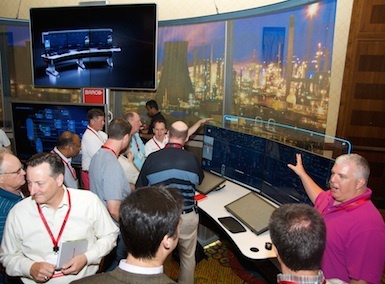 In December 2014, HPS will establish the Honeywell Industrial Cyber Security Lab near Atlanta (GA USA). The lab will expand the company’s research capabilities and will feature a model of a complete process control network which Honeywell cyber security experts will leverage to develop, test and certify industrial cyber security solutions. This lab will help accelerate proprietary research and development of new cyber technologies and solutions to help defend industrial facilities, operations and people. • Four in ten (40 percent) survey respondents are not sure about how well their government or private industrial sectors are able to defend against cyber hackers, including 10 percent who are not at all confident. • When asked about the vulnerability of nine critical industry sectors (which have varying degrees of computer and internet security systems in place to guard against cyber hackers), majorities of respondents globally see all sectors as being vulnerable to cyber attacks. Industrial sectors likely to be perceived as vulnerable to such attacks include oil and gas production (64 percent), medical/health care/pharmaceuticals (64 percent), power grid (63 percent), chemicals (61 percent) and aerospace/defense (59 percent). • Those in India (92%) and Japan (89%) are most worried about cyber attacks, whereas Russian adults (53%) express the lowest level of overall concern. • Among those who are relatively unconcerned about cyber hackers (“not very fearful” or “not at all fearful”), no single factor stands out as a primary justification. Many (31 percent) say that this is because they believe the risk of something major actually happening is really quite low, particularly in Australia (52 percent). • Governments and its intelligence and armed forces will not let this happen (24%). This year the Abnormal Situation Management (ASM®) Consortium is celebrating 20 years of thought leadership in the process industry. The ASM Consortium grew out of a grassroots effort begun in 1989 by ASM to address alarm floods. Honeywell spearheaded the development of a proposal to the US NIST, Advanced Technology Program to form a Joint Research & Development Consortium. Background on the ASM Consortium The ASM Consortium was started in 1994 to address Process Industry concerns about the high cost of incidents, such as unplanned shutdowns, fires, explosions, emissions, etc. The term, Abnormal Situation Management®, was used to describe it. Matching funds from NIST enabled the consortium to spend several years researching and developing highly-advanced concepts to address the problem of abnormal situations. Since then research has continued and increasing effort has been put into development and deployment of solutions that incorporate ASM knowledge.The basis of the ASM Consortium is collaboration and information-sharing. By working together, members achieve far more than they could working alone. Research results are published for members, and often further shared by means of webinars, seminars and workshops. User members also guide Honeywell in selection and development of product solutions that incorporate ASM knowledge. Non-members can benefit from ASM Research as ASM Effective Practices Guidelines for Alarm Management, Display Design and Procedural Practices are available for purchase on Amazon.com. The proposal addressed the challenging problem of abnormal situation management. In preparing for this proposal effort, Honeywell and its collaborators created the Abnormal Situation Management (ASM) Joint Research and Development Consortium (referred to as ASMC) under the U.S. Cooperative Research and Development Act. In November 1994, the ASM research joint venture began its research with $16.6 million (€12.27m) in funding for a three year study program, including $8.1 million (€6m) from ATP and industry cost-sharing of $8.5 million (€6.29m). This year, ASM Consortium members have met twice for a week-long Quarterly Review Meetings (QRM) , once at Houston, Texas (USA) in April and then again at Antwerp (B) in June. Along with its normal business, the Consortium discussed plans to celebrate the Consortium’s 20 year of service to the Process Industry. The Quarterly Review Meetings are a platform for the ASM Consortium members to share the benefits gained from the ASM practices and products, and to discuss new challenges faced in plant operations. Members of the Consortium besides Honeywell include industrial manufacturers, a human factors research company, and universities that collaborate to research best practices for managing abnormal situations in industrial facilities. To celebrate its 20th year, ASM Consortium will be spreading further awareness about managing and mitigating abnormal situations in process industries by publishing journal articles, white papers at leading industry conferences, and a planned video. Major award for Honeywell chief! Recognises the transformation of Honeywell his leadership over the past decade! 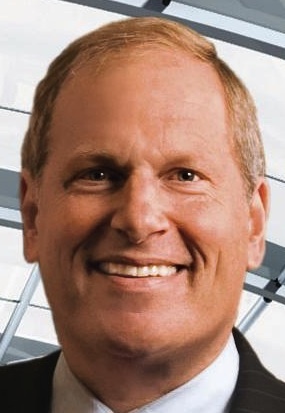 Chief Executive Magazine has named named Honeywell Chairman and CEO Dave Cote “2013 CEO of the Year,” an honour that recognises an outstanding corporate leader nominated and selected by peers. The award will be featured on the cover of Chief Executive Magazine’s July issue. The award recognises the transformation of Honeywell under Cote’s leadership over the past decade. During that time, Honeywell has increased sales by 71% to $37.7 billion, pro forma EPS by 197% to $4.48, and delivered a total shareowner return of 240%, consistently outperforming the S&P 500 during that timeframe. Today, Honeywell is a global company, with 54% of sales coming from outside the U.S. versus 41% ten years ago. Since 2003, Honeywell has made more than 75 acquisitions and 50 divestitures, building great positions in good industries around the world. Cote was appointed by US President Obama to serve on both the bipartisan National Commission on Fiscal Responsibility and Reform (commonly known as the Simpson-Bowles Commission) and the U.S.-India CEO Forum. He’s been a leading voice and Steering Committee member of the Campaign to Fix the Debt and is widely quoted by top-tier media on how debt reduction must continue to be our top priority to grow the U.S. economy at a pace that will create new jobs. In addition to debt reduction, Cote’s outline for an American Competitiveness Agenda includes energy policy, free trade, infrastructure, math and science education, and tort reform. Nominations for CEO of the Year were garnered from Chief Executive Magazine’s 124,000 readers. The ten most frequently cited nominations were evaluated and a winner was voted upon by a peer Selection Committee consisting of CEOs from leading global corporations. Cote received the Corporate Social Responsibility Award from the Foreign Policy Association in 2007, the Distinguished Achievement Award from B’nai B’rith International in 2011, the Asia Society’s Global Leadership Award in 2012, and the Peter G. Peterson Award for Business Statesmanship from the Committee for Economic Development in 2012. 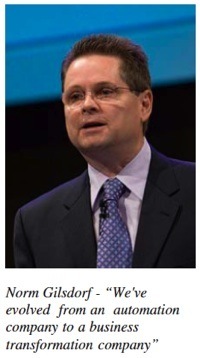 In 2013, Cote was recognized as one of the World’s Best CEOs by Barron’s magazine, and honored with the Corporate Leadership Award by the TechAmerica Foundation. Cote’s selection as 2013 CEO of the Year will be celebrated at an event hosted by ChiefExecutive in partnership with NYSE at the New York Stock Exchange on Thursday, July 25. Last month the INSIDER discussed the abandonment of the ISA100.12 committee deliberations, without any final result or report. This has produced no comment or reaction from the ISA directly: while they do not subscribe to the INSIDER, they were provided with an advance copy of that issue. What is more interesting is that a correspondent with close links to Honeywell has confirmed that all “new” OneWireless instruments from Honeywell are now shipped with the ISA100.11a protocol. The Honeywell involvement with wireless transmitters, and indeed their ‘OneWireless’ systems pre-dated the ISA100 standard. Indeed Honeywell put in a lot of expertise and specification suggestions gained from their OneWireless systems into the ISA100 standard development process. OneWireless did have a different protocol to the standard that eventually emerged as ISA100.11a. However, Honeywell made the commitment that “all OneWireless pre-ISA100 instruments supplied will be upgradable, or able to migrate to, ISA100 wireless”. • See also Gary Mintchell’s “Puzzlement In Industrial Wireless Network Land,” written on his return from the Hannover Fair! Honeywell issued a press release early in April, announcing a new version of OneWireless, which is named as “Release 210 (R210)”. This stated to include “over-the-air field device provisioning and a Gateway General Client Interface made possible by the ISA100 standard”. 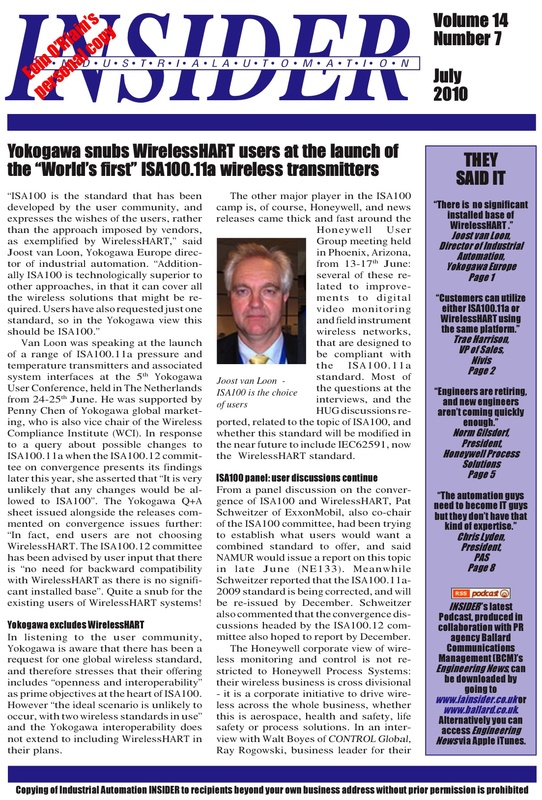 Ray Rogowski, global marketing director for wireless in HPS is also quoted to say: “With OneWireless Release 210, users can benefit from the flexibility and scalability offered by the ISA100 standard….”. This does seem to be a statement from Honeywell fairly definitely saying that OneWireless Release 210 will be using ISA100, which is a welcome change of emphasis compared to previous news releases. To interpret some of the phrases used I spoke to Soroush Amidi in their Networks and HPS Wireless Solutions Team. Amidi explained the OneWireless history, in relation to the release versions quoted. Full exproduction ISA100 compatibility came not after the addition of the Cisco Aironet 1552 access point in November 2011, as previously assumed by the INSIDER, but with Release R200, which was announced in June 2010: so actual deliveries started approx from 1-1-2011. In fact, the Cisco Aironet access point was introduced for clients who preferred to have Cisco systems in their IT structure, and needed the wifi interface also provided. Diederik Mols, introducing the Aironet at the HUG European meeting (INSIDER November 2011 page 5) specifically mentioned Shell in this context. The HPS Multinode and separate Field Device access points are both still available and offered with R210. Prior to R200, the OneWireless R120 had offered all the functionality of ISA100, but did have a different protocol to the standard that emerged as ISA100.11a. However, Amidi stated that “all OneWireless R120 systems and instruments can be upgraded to ISA100 wireless using an over-the-air download”, if the customers have a need to move up/upgrade to this R200 level. In a similar way R200 systems can be migrated to R210 using another over-the-air software upgrade. With R210 Amidi explained the language used in the recent press release, which originates somewhat from the detailed, somewhat esoteric wording of the ISA specification work. Field device ‘provisioning’ relates to the initial acceptance of a new device onto the network, by passing over the network access code: the ISA standard has the option for clients to do this either wirelessly, or via a local infra-red communications device, which is seen to add more security in some situations. Soroush Amidi explained this in terms of working with Enraf radar level gauge systems, which use a proprietary protocol to send custody transfer data to the Enraf Entis Pro software application, or GE Bently Nevada vibration monitoring systems which use a proprietary protocol to send the vibration signatures to their System 1 software application. This data can be wrapped in an ISA100 compatible packet, which is allowed within ISA100, and transmitted over the network, for unwrapping at the other end, and delivery to the appropriate analysis system: the whole process is described as ‘tunneling’ the data. Vendors such as Enraf and Bently Nevada are pleased to take advantage of this system, says Amidi, as it retains their intellectual property and proprietary information processing, takes advantage of a plant wide wireless network, but does not require the significant development work and investment by them in producing a fully ISA100 compliant sensor. Amidi pointed out that much of the information about ISA100 installations is passed by personal contacts, and by such routes as the ISA100 interest group on ‘Linked in’ – where Amidi seems to have been the main recent commentator. A recent addition there is a video from the ISA WCI technical seminar in Kyoto back in 2011, where Berry Mulder from Shell Global Solutions, who is also a director of WCI, explains why wireless is so important to Shell. 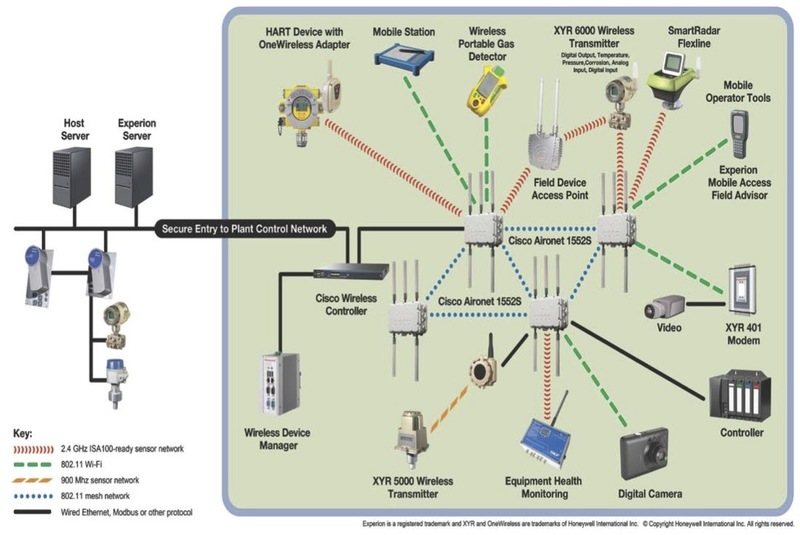 The Shell presentation laid emphasis on the need for wireless gas detection (and personnel location) which brought to mind the Honeywell wireless gas detector, a product development mentioned as essential in relation to the Shah Gas project some two and a half years ago (INSIDER November 2010 page 3, and November 2011 page 7). Still no listing for such a product on the WCI ISA100 product lists, so presumably the devices that were quoted as delivered to Shah Gas in 2012 used plain OneWireless compatibility. However, the GasSecure infra-red hydrocarbon gas detector from Norway mentioned at the Invensys OpsManage11 conference (INSIDER November 2011 page 7) does have a WCI listing, even if no approval is quoted. Boosted attendance at user group event! The Honeywell User Group convened again mid June, in Phoenix, Arizona, for the annual meeting, billed as for the Americas, but with 1000 plus attendees from 34 countries, it was more like a world event – back at the attendance levels of 2007, and double those from last year (INSIDER, July 2010 page 4). However, as Gary Mintchell observed, and pointed out in his FeedForward blog, the ratio of staff to users has decreased in these events, so the user numbers were even more impressive. Just like last year, Norm Gilsdorf, president of Honeywell Process Solutions (HPS), opened the conference with a keynote speech commenting on four vital elements: – for 2010 you may remember they were the “-ty” elements, like uncertainty, and availability (of capital), safety and security, availability (of engineers), and utilities (green energy and water). Some of these came through to 2011, but there was no mention of uncertainty and capital availability as constraints, which must reflect a general upward mood-swing. Mobilization of people and assets is important, Gilsdorf said, but process industries are really only just beginning to adapt to this trend. By mobilization, he means information transfer to people on the plant or on the move: “Getting information to the right place, to the right experts, wherever they are in the world, can also create a competitive advantage.” Mobile computing devices are being used within industry: “We need to learn to leverage that in the process industries—so you can make faster decisions, better decisions, decisions that sometimes don’t need operator intervention, decisions that help you solve problems better, in a faster way,” he said. Integration and collaboration means Honeywell has been working more closely with the supply chain, with companies such as Microsoft, IBM and SAP, and also refers to the recent acquisitions of Matrikon and RMG: the careful addition of such acquisitions is seen as a Honeywell strength. However, maybe the recent focus on acquisitions like Enraf and RMG has brought management attention back onto field devices, where they realize that investment has lagged behind competitors: one of the new divisions created is to concentrate on field instruments. Gary Mintchell also reported that Gilsdorf is forecasting increased investment to add more intelligence onto standard field devices in the coming year. He also has committed to bring in 50 new young engineers into HPS centres across the world every year, to enhance both HPS and the industry in terms of youth and expertise. Jason Urso, chief technology officer at HPS, then detailed some of the major new product launches and developments of interest for 2011, in a fairly packed presentation. First came the Honeywell approach to reducing TCO (Total Cost of Ownership), a critical priority for HPS. Major user attention in Phoenix was paid to all lectures discussing virtualization technology, to be available with the Experion PKS, via the Honeywell collaboration with VMWare, by Q3 2011 (VMWare was a sponsor of the HUG conference, as were Microsoft and Matrikon). Virtualization is promoted by HPS since it can reduce the PC hardware users need on site by around 90% in some cases. Mobilization now allows DCS information to be transmitted via OneWireless from the Experion PKS to integrate smart devices in the field network, such as the Dolphin operator interface from Honeywell Hand Held Products, making operators more efficient in the field: also data can be transmitted securely to commercial devices, such as iPhone and iPad. Also for these mobile operators, Honeywell are still planning the launch of the personal gas alarm and wireless locator in 2011: first discussed at the HUG European meeting in October 2010 (INSIDER November 2010, page 3) this was new to the US audience, and described as “game changing” by Urso, so possibly includes other capabilities. Similar devices offered for lone worker protection (but in non-hazardous areas) by Intelligent Distributed Controls in the UK use ZigBee wireless communications, and include temperature monitoring and a positional location engine, based on the inputs from built-in accelerometers: these sensors also provide a tilt alarm, triggering if the operator should fall. The basic Honeywell concept is for a five gas detector, which alarms locally and back in the control room, with an ability to provide location information on the plant, so help can be despatched – for example if there is no movement or response. The location data can also be used to alert control rooms if personnel or contractors, equipped with the devices, stray into areas of plant where systems are being started up, etc. A n o t h e r OneWireless capability introduced at HUG was the Wireless Rotating Equipment Solution, a package of the XYR6000 Multiplexer wireless vibration monitor and the enhanced Asset Manager R400 software for online performance and condition monitoring, targeted at assets that were not previously monitored with static vibration monitors. The XYR6000 offers a four year battery life from field replaceable intrinsically safe batteries. 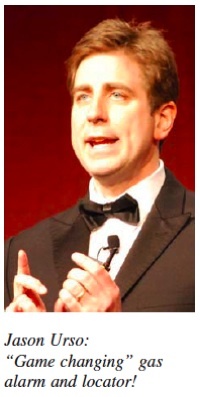 •The next HUG is scheduled for Phoenix (AZ US) 10-15 June 2012. Industrial Automation INSIDER is Britain’s only independent subscription newsletter providing industrial measurement and control systems users and suppliers with a monthly update on the continuing evolution and convergence of systems technologies. Each month it reports on and provides informed comment on developments as they affect every industry sector from chemicals, petrochemicals and utilities to building automation, pharmaceuticals, food and drink and discrete piece part manufacture.